Jana Vonaskova-Novakova and Vlastimil Holek violins. Josef Kluson viola, Michal Kanka cello. Ivan Klansky piano. 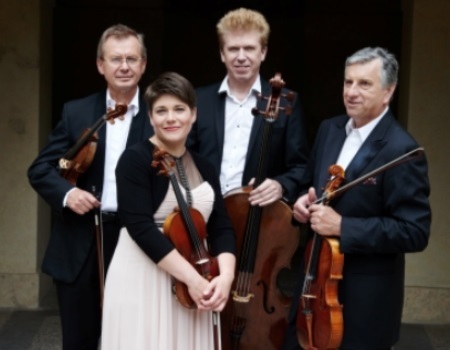 This leading Czech Quartet performs in Leamington for the first time, but the new leader, Jana Novakova, has played in the Royal Pump Rooms several times in duos and a piano trio. The Prazak is joined by Ivan Klansky of the Guarneri Piano Trio for Antonin Dvorak’s popular Piano Quintet and the programme starts with an important work by his son in law Josef Suk, followed by the extra-ordinary first of the two quartets by Bedrich Smetana, regarded as the founder of Czech music.